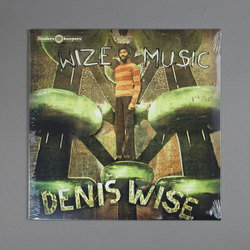 Denis Wise - Wize Music. Vinyl LP. Bleep. Ask yourself this: if Laraaji, Can and Parliament-Funkadelic made an LP of wildly ambitious psychedelia together, what would it sound like? Tantalising and impossible as it seems, the early ambient electronic work of the shapeshifting trickster Denis Wise — aka Dennis Wise, Denis Weise, Dr. Wise, etc. — might just fit the bill. Wize Music is the first attempt to collate and compile his various solo and group compositions between 1979 and 1984. Unsurprisingly, it’s totally all- out anything-goes fun.